This article is about car chassis. 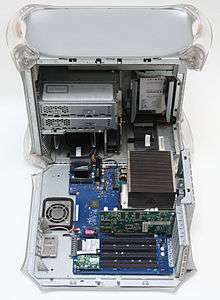 For computer chassis, see Computer case. A chassis (US English /ˈtʃæsi/, UK English /ˈʃæsi/; plural: "chassis" /ˈtʃæsiz/ or /ˈʃæsiz/) consists of an internal vehicle frame that supports a manmade object in its construction and use, can also provide protection for some internal parts. 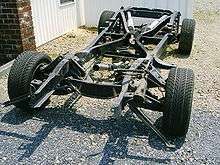 An example of a chassis is the underpart of a motor vehicle, consisting of the frame (on which the body is mounted). If the running gear such as wheels and transmission, and sometimes even the driver's seat, are included, then the assembly is described as a rolling chassis. For commercial vehicles, a rolling chassis consists of an assembly of all the essential parts of a truck (without the body) to be ready for operation on the road. The design of a pleasure car chassis will be different than one for commercial vehicles because of the heavier loads and constant work use. Commercial vehicle manufacturers sell "chassis only", "cowl and chassis", as well as "chassis cab" versions that can be outfitted with specialized bodies. These include motor homes, fire engines, ambulances, box trucks, etc. In an electronic device, the chassis consists of a frame or other internal supporting structure on which the circuit boards and other electronics are mounted. In the absence of a metal frame, the chassis refers to the circuit boards and components themselves, not the physical structure. Wikimedia Commons has media related to Automobile chassis. ↑ Association of Licensed Automobile Manufacturers (U.S.) (1922). Official Handbook of Automobiles. National Automobile Association. p. 180. OCLC 6360726. Retrieved 10 September 2010. ↑ Sturmey, Henry (2 April 1908). "The Use of Unsuitable Vehicles". Commercial Motor. 7 (160): 146–147. Retrieved 10 September 2010. ↑ Grenzeback, Lance R.; Lin, Sandi; Meunier, Jacob (2005). Operational Differences and Similarities among the Motorcoach, School Bus, and Trucking Industries. Transportation Research Board. p. 13. ISBN 978-0-309-08821-3. Retrieved 10 September 2010. ↑ Starry p. 45, 79, 129, 143, 153, etc. ↑ Khandpur, Raghbir Singh (2006). Troubleshooting Electronic Equipment. McGraw-Hill Professional. p. 45. ISBN 978-0-07-147731-4. Retrieved 10 September 2010.